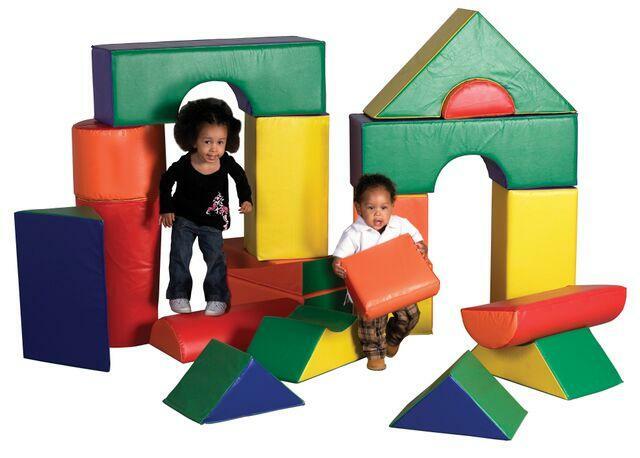 A set of 21 jumbo soft blocks, designed just for young architects, engineers and builders! Encourages social interaction, imagination and invention as well as gross and fine motor skills. Soft, sturdy, polyurethane foam shapes are covered in reinforced, phthalate-free vinyl to create a comfy and stimulating learning environment. Color varies. Dimensions: Block sizes range from: L: 12" x W: 12" x H: 6" to L: 17" x W: 12" x H: 34"